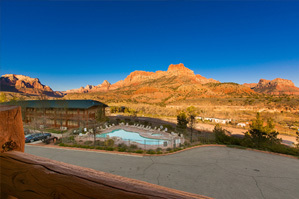 Our lodge is located in Springdale, which is the gateway community at the main entrance to Zion National Park. It is a small community offering full visitor services, including a surprising number of excellent restaurants and stores. You can visit the Zion National Park website to see what restaurants are located in town along with tour companies and galleries to visit. Springdale itself is scenic, with picture postcard views in every direction. The Virgin River runs through town. Tree-lined streets end against red cliffs, with Zion’s monuments towering in the background. The Zion Park shuttle runs through town, making it easy and convenient for visitors to get from our lodge to attractions inside the park. We are located just three miles from Zion Park’s main entrance. From our lodge you can see into the park, glimpsing its stunning scenery. A short drive or shuttle ride will put you into Zion Canyon, where the park’s most popular attractions are located. Zion is the most popular national park in Utah, and one of the most popular in America. It offers something for everyone, from auto touring and relaxing walks to intense hikes and thrilling canyoneering adventures. Our lodge is about 90 miles – an easy daytrip – from Bryce Canyon National Park. At Bryce, wind and water have eroded the mountainside into an enchanted amphitheater full of multi-colored hoodoos and pinnacles. The park is a photographer’s delight. 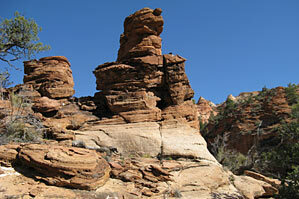 You can auto tour to many of its key vistas, and hike or ride horseback down amid the fanciful rock formations. The Grand Canyon – one of the Seven Natural Wonders of the World – is about 95 miles from our lodge. The park’s North Rim is a must-see; it offers the most spectacular views into the gargantuan canyon. You can easily auto tour North Rim viewpoints during a day trip from Majestic View Lodge. 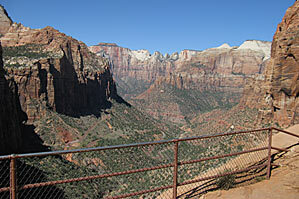 Zion National Park offers many trails ranging from short “leg-stretcher” walks to strenuous adventures. If you wish to go into the backcountry it is best to check in at the visitor center in Zion National Park for detailed information on the trails of your choice. A variety of life zones and habitats makes Zion an excellent location for wildflower walks in spring and brilliant leaf color in autumn. In the spring the cactus are blooming and Indian Paintbrush is visible throughout much of the summer season. 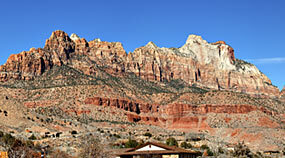 Inside and outside of Zion National Park you may enjoy riding horseback along scenic trails and / or to scenic overlooks. Horseback riding in this area takes you back to the times of the old west when many were discovering this region for the first time. Options for riding are for one hour through a full day or multi-day ride. 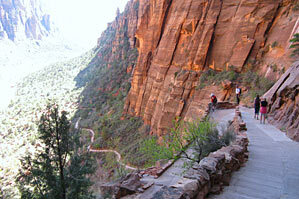 The Pa’rus Trail offers a paved, carefree alternative for bicyclists to connect with the Zion Canyon Scenic Drive. Shuttle buses are equipped with bike racks. Biking is a great experience in and outside of the park with many trails in the surrounding area that will take you to scenic overlooks and through some spectacular backcountry. Check for more details with a local bike shop. Vehicle. Guided tour operators will show you how to operate the machines and then lead you on your adventure. Zion is known for its traditional and aid climbing. Visitors to the park will frequently see climbers perched high on any one of Zion’s most magnificent walls. You may ride the river when the water levels are good. Take a nice cool adventure ride through the park and into the town of Springdale via the Virgin River. This is the river that carved the deep and grandiose canyons of Zion National Park. class family entertainment and education. With amazing shows throughout the seasons, Tuacahn has must see shows you wouldn’t want to miss. Planning a wedding or group event during your trip to the area? Zion Party Rentals can assist your group with offsite event rentals and service. We are a local company serving the Zion Canyon/Springdale area. We work with local restaurants and venues to make your event unforgettable. Get ready to tour through our beautiful Southern Utah mountains on your own Rhino ATV. Travel through hidden secrets located around Zion National Park, glide across large dunes of sand and visit breathtaking mountain top views from the large plateaus of southern Utah.